I edit a lot of \(\LaTeX\) documents using AUCTeX in Emacs. 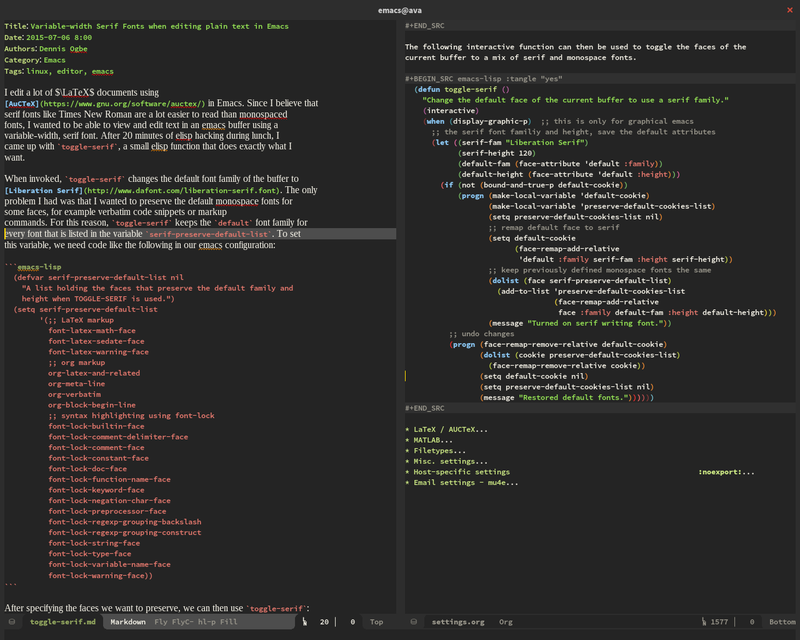 Since I believe that serif fonts like Times New Roman are a lot easier to read than monospaced fonts, I wanted to be able to view and edit text in an emacs buffer using a variable-width, serif font. After 20 minutes of elisp hacking during lunch, I came up with toggle-serif, a small elisp function that does exactly what I want. When invoked, toggle-serif changes the default font family of the buffer to Liberation Serif. The only problem I had was that I wanted to preserve the default monospace fonts for some faces, for example verbatim code snippets or markup commands. "Change the default face of the current buffer to use a serif family."